Is there any other side of business? We say no. The results of this year’s Salary and Employee Satisfaction Survey brought us many familiar trends, painting a picture of overall satisfaction among lab professionals. The business term “change management” has been around for a while. The term relates to initiating significant change within an organization’s processes. Your success often depends upon networking; getting yourself out there, making connections, and enjoying face time with peers and potential employers. In our fast-moving 21st-century economy we increasingly see laboratory facilities relocating, expanding rapidly, or, in some cases, closing. Networking is critical to keep you connected to the people and resources you need to excel in your career and find new opportunities. Just like most workplace settings, excessive noise in chemical and analytical laboratories can be a serious issue on several fronts. When labs are expanded or renovated, plans for the protection of staff working in and around the construction site are often overlooked. The only good way to prepare for an emergency situation is to think through how you should respond and then practice doing it correctly. Associate editor Rachel Muenz speaks with research scientists Freya Freestone, MChem, and Helen O'Shea, BSc about data processing, analysis, and managing workflows in the lab. The many variables involved in pesticide use presents special challenges when it comes to food safety analysis. Cell culture today presents a subtle paradox. Coaxing cells to produce biopharmaceuticals, vitamins, and industrial products requires inserting foreign genes and adapting cells to artificial growth conditions. The number and types of cell-based assays (CBAs) are as diverse as a cell’s observable biochemical activity. The wide variety of lab shaker designs on the market reflects the increasing diversity of scientific experimentation. Labs now use a greater range of sample sizes than ever before, from liters to microliters. 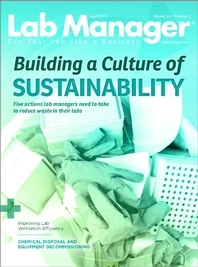 Laboratories today face complex scientific and business challenges that require key insights into laboratory operations. Mobile features make an electronic lab notebook (ELN) more adaptable and efficient. With the promise of personalized medicine, the drug and diagnostic industries are booming,as are academic medical research programs. Metabolism is at the core of cell biology, and metabolic dysfunction is known to play a majorrole in disease pathology and etiology. The latest equipment, instruments, and system introductions to the laboratory market. This month, we highlight companies exhibiting at the Gulf Coast Conference. Shared facilities or common equipment rooms, often result in a laboratory having a number of unique users with varying levels of centrifuge experience.